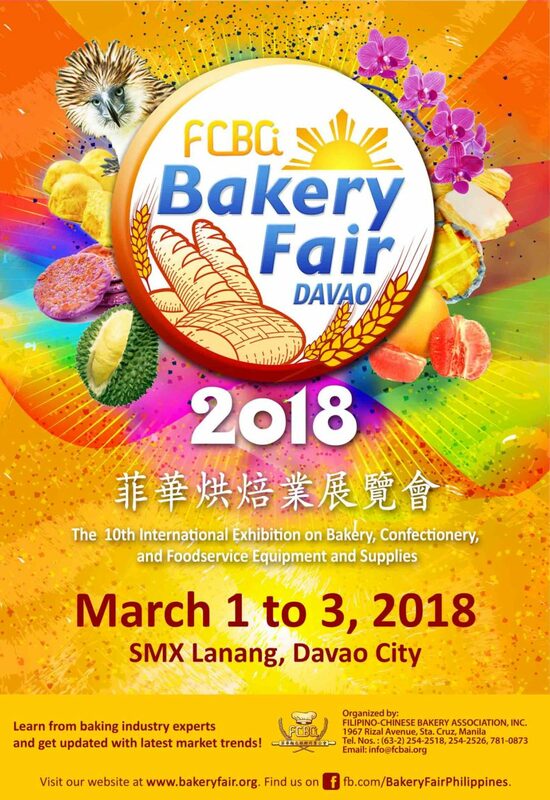 Bakery Fair Davao: 2018 – Filipino-Chinese Bakery Association Inc.
On March 1-3, 2018, the Filipino-Chinese Bakery Associaton, Inc. (FCBAI) will be holding the 10th International Exhibition on Bakery, Confectionery and Foodservice Equipment & Supplies dubbed as, “BAKERY FAIR 2018-DAVAO” at the 3rd Floor of SMX Convention Center, Lanang, Davao. 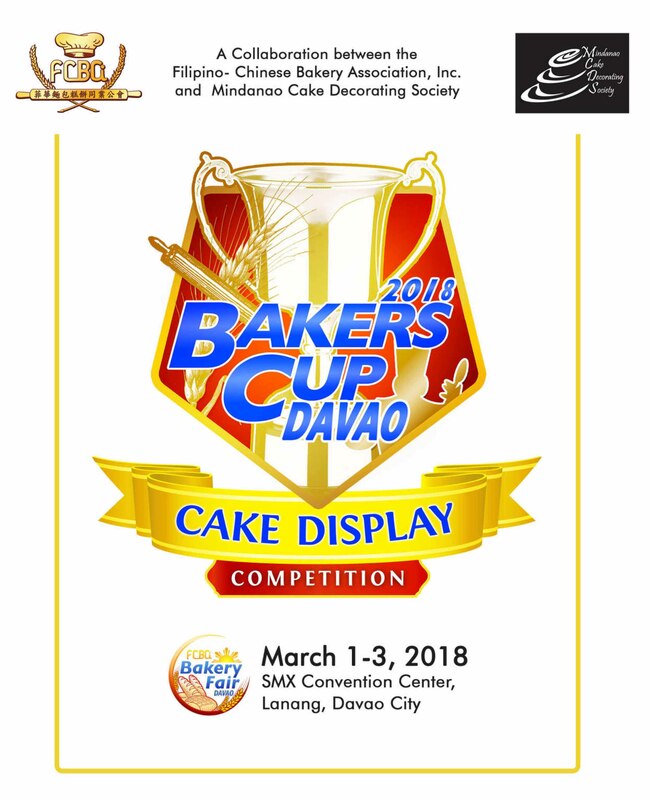 Another highlight of the event that may launch our talented Filipino Bakers to international recognition is the 2018 Bakers Cup Davao – Cake Display Competition, a collaboration with Filipino-Chinese Bakery Association, Inc. (FCBAI) and Mindanao Cake Decorating Society. 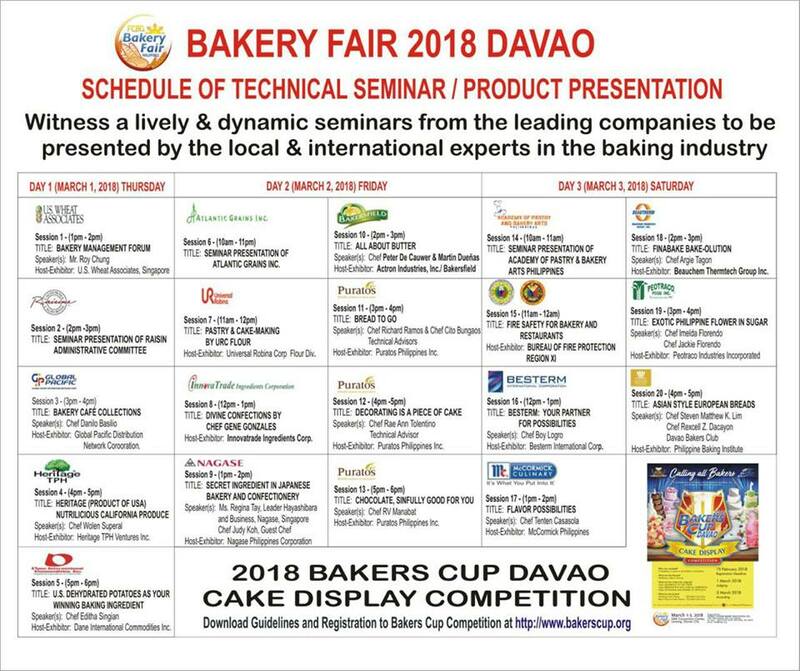 The competion will highlight the Best of Davao and Wedding Cakes. There will be 76 local and foreign exhibitors who will be participating and over 5,000 visitors are expected to attend. 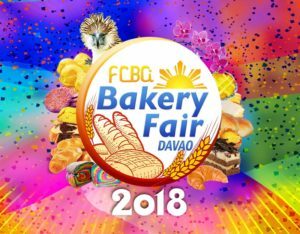 Bakery Fair 2018-Davao will surely bring a lot of excitement, innovative ideas and creative techniques for each and every visitor with baking seminars, product demonstrations, competition and cake displays from world class bakers and different companies. 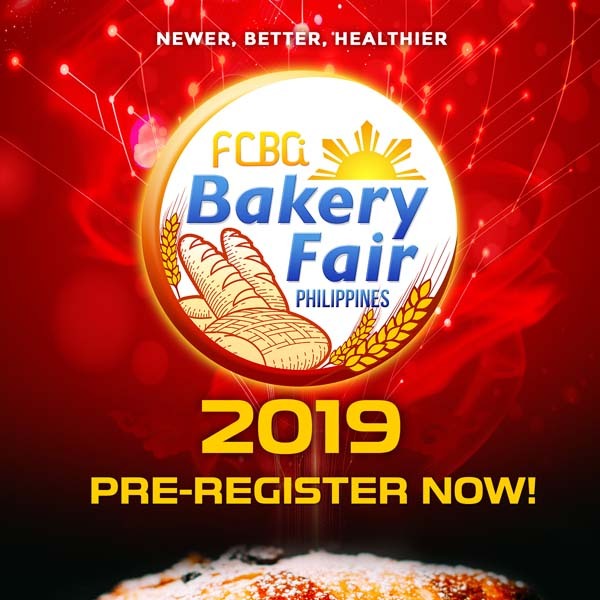 Bakery Fair is the only specific event that caters to the baking and foodservice industry in the Philippines. 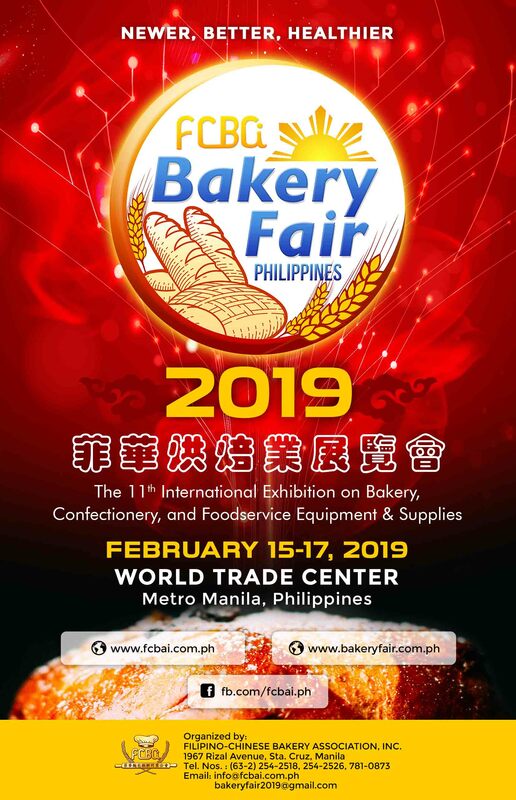 Bakery Fair contributed to the evolution and expansion of the Philippine Baking Industry, especially as consumer demands for quality bread and baked goods rises and palates become more sophisticated. 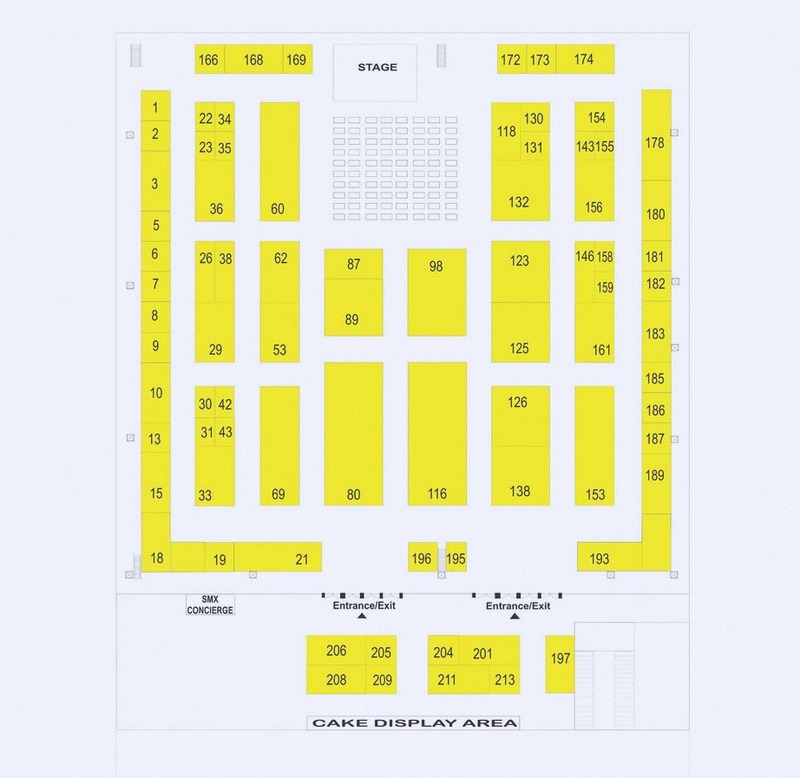 For safety reason, children under the age of 12 will not be admitted inside the exhibition hall. Visitors wearing slippers, shorts, sleeveless undershirt will not be allowed entry.